The adoption of enterprise content collaboration solutions has exploded as individuals sought ways to easily access, manage, and collaborate on content. Accordingly, businesses want to leverage those easy-to-use solutions but can’t compromise when it comes to enterprise-grade administrative control, security, and business insights. Dropbox, a popular consumer tool for sharing photos and personal files, is a common consumer solution that individuals began bringing into the workplace. 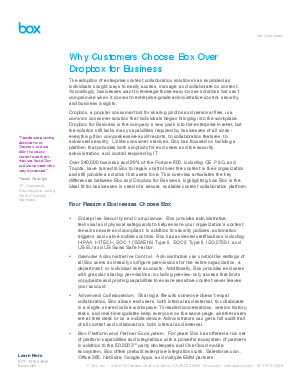 Dropbox for Business is the company’s new push into the enterprise market, but the solution still lacks many capabilities required by businesses of all sizes - everything from comprehensive audit reports, to collaboration features, to advanced security. Unlike consumer services, Box has focused on building a platform that provides both simplicity for end users and the security, administration, and control required by IT.